Flags: In this work I have chosen to combine design elements from both the British and Maori cultures on the flags/ensigns. This piece talks about the arrival of both peoples to Aotearoa and the integration of the different cultures. The top flag is based on the traditional New Zealand Ensign made official in 1902. The second is the flag which was chosen by the ‘United tribes of New Zealand’ a collective of Northern Maori Chiefs who were offered 3 designs to choose from. This was the first New Zealand flag. The original had 8 pointed stars and black edging but was altered in 1835 to the one shown on the painting. I have added the carving designs on the red as a way to incorporate a traditional Maori design element. 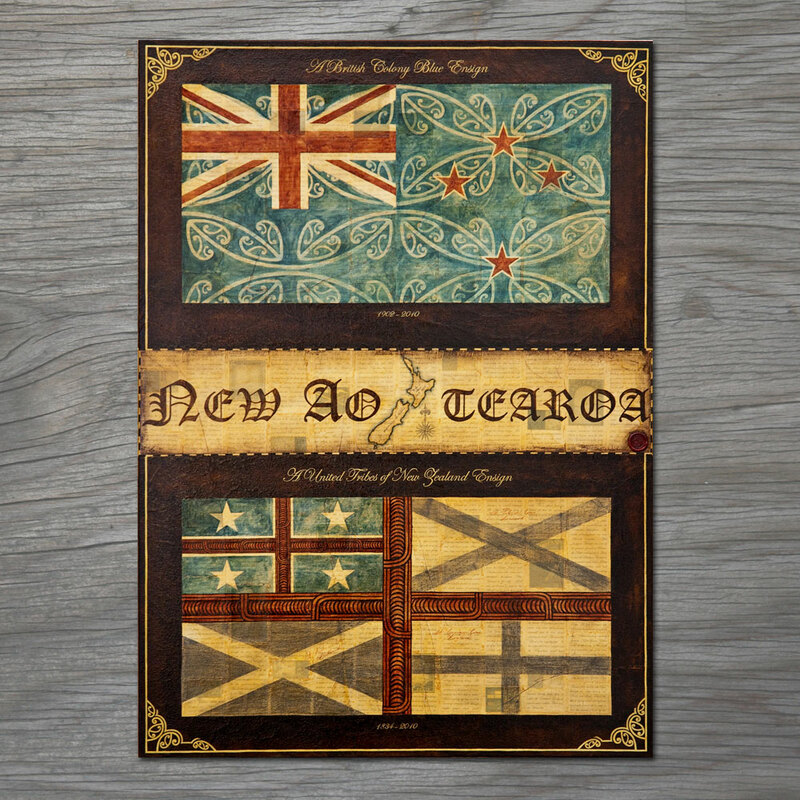 New Aotearoa: The word Aotearoa has been broken in to two parts creating ‘New Ao’ which means ‘New World’ meaning the beginning of a Nation. The beginning of a new consciousness and new belief systems.